Model Wash is not flammable, and does not contain solvents. Please see also certified safety information of the product on the Safety page. 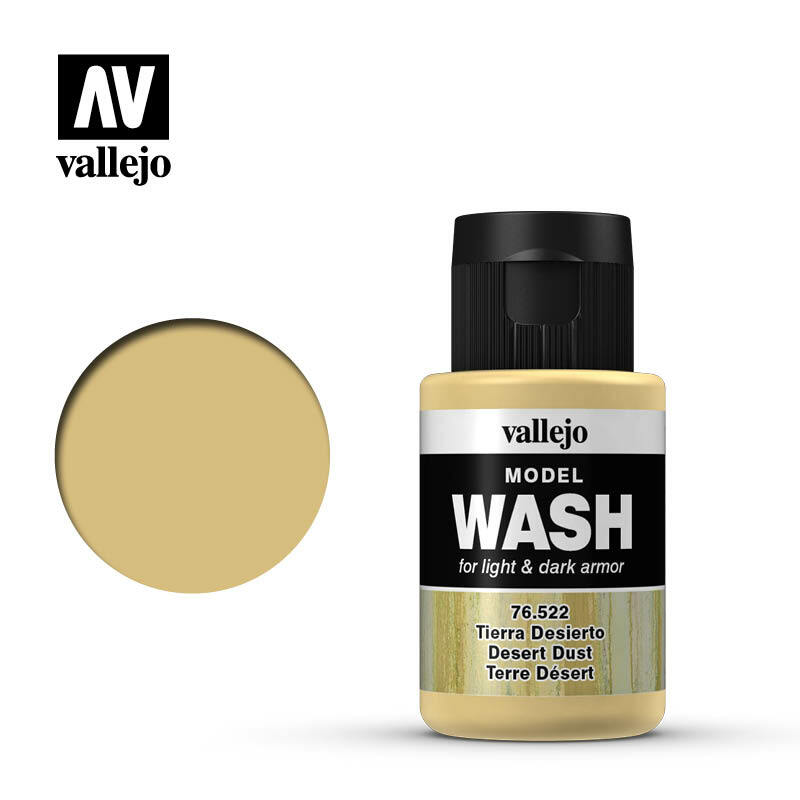 Applications: Model Wash Dark Yellow 76.503 is recommended for yellow models and light colors. Also very suitable for all camouflages and natural scenes with vegetation, rivers and lakes. Applications: Model Wash Light Rust 76.505 is recommended for rust effects and winter scenes, cold scenes and decay or abandoned vehicles, metallic structures or all kind of metallic parts. Applications: Model Wash Dark Rust 76.507 is recommended for rust effects and winter scenes, cold scenes and decay or abandoned vehicles, metallic structures or all kind of metallic parts. Applications: Model Wash Dark Green 76.512 is recommended for all models painted in green, and is also perfect for camouflage colors and natural scenes with vegetation, rivers and lakes. 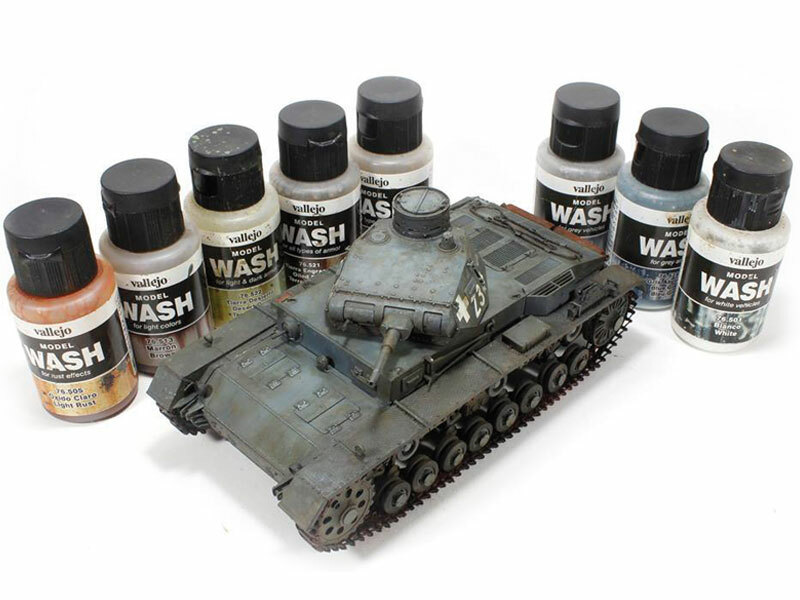 Applications: Model Wash Brown 76.513 is recommended for models painted in light or sand colors, and ideal for application on tank tracks and pin washes. Applications: Model Wash Light Grey 76.515 is recommended for models painted in grey and dark colors; they are also perfect for rain marks and pin washes. Applications: Model Wash Dark Grey 76.517 is recommended for models painted in grey and dark colors; they are also perfect for rain marks and pin washes. Applications: Model Wash Black 76.518 is recommended for ultra dark washes and pin washes in the most recessed areas or parts. Applications: Model Wash Olive Green 76.518 is recommended for adding shadows around rivets or recessed details on vehicles painted in Olive Green or faded Pale Green. Applications: Model Wash Dark Khaki Green 76.519 is recommended to produce depth effects and natural shadows on vehicles painted with a khaki base color or light camouflage tones. Applications: Model Wash Oiled Earth 76.521 is recommended to produce the effects of accumulated dirt when oil, grease & fuel combine with caked dust on vehicles, wheels and other moving parts. Applications: Model Wash Desert Dust 76.522 is recommended to produce the natural accumulation of dust on vehicles painted with light or dark colors, especially in dry and desert climates. Applications: Model Wash European Dust 76.523 is recommended for all types of vehicles; the wash represents the most common tones of dust in central and eastern Europe. Applications: Model Wash Blue Grey 76.524 is recommended for vehicles with a Panzer Grey base color, as well as all vehicles with a similar grey base.